It's final title is Foray in the Forest. Mr. M started this mod way back in 2009 but unfortunately lost all of his data due to a hard drive crash. In 2016 I picked up this abandoned project and rebuild everything from scratch. A first demo was released on KeenDay 2017. The mod is progressing slowly but continuously. The goal is a full 18 level mod. Of course some fine PCKF denizens contribute and collaborate to make this mod great again. yes, we can. Ten levels are currently being worked on. exhausting. Helping hands are very welcome! I can't comment on this, as the mod isn't done. I'm modding the tileset and adding/replacing tiles as I need them. Since my plan is to have this take place on Gnosticene IV, most of the graphics and monsters will remain or be somewhat Keen 4 related. Of course I will still providing a new experience. 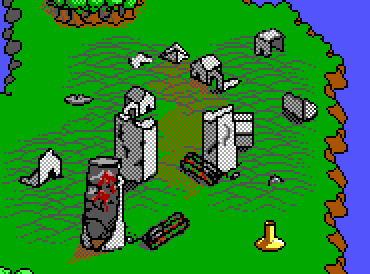 what I can say though is that lemm did some fine tricks to expand the tilesets! dope! Nineteen enemies are more or less done. Just a one or two creatures need to be animated. I'm still looking for a good idea. The image above is just a placeholder. Contributions or inspirations are very welcome. The only premise: it needs to be forest related. Details can be discussed via pm. Well, my grammar skills require a ghostwriter. Last edited by Nisaba on Sat Dec 08, 2018 10:57, edited 5 times in total. Like said before, I'd use the outlined version if it is going to be used as a platform (which it does look like). The dithering depends on what kind of background will be used. The black colouring may have the trunk blend in with the background more than you might want. I personally like it as it is but I've also not seen it in combination with other tiles. thanks for your outlined and unoutlined (what?) suggestions. 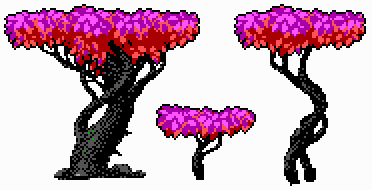 I think I'm going to add some black pixels around the leaves section. Last edited by Nisaba on Thu Oct 18, 2018 20:49, edited 1 time in total. what do you think about the dithering of the tree trunk? 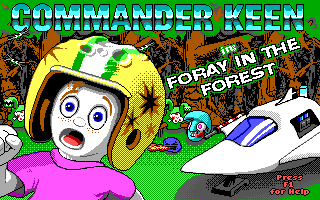 don't you think that they might look a bit overly realistic for Keen IMKO? 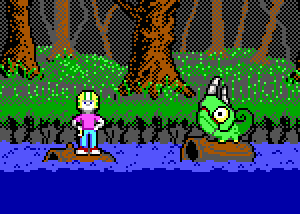 Depends a lot how it looks with other tiles, but if it were my tiles I might try lessening the dithering and combining stuff into larger globs of monocolour gray. 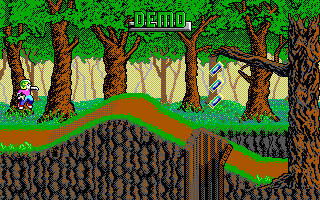 I like the tree trunk dithering and don't think Keen looks out of place next to them. thanks for the dithering feedback. I did some testing with different backgrounds/arrangements. it seems to me that it really depends on the surroundings. that being said, i'll have to adjourn the decision how much dithering is needed until the other design pieces are done. still: your feedback is always very welcome! Next up I'd like to ask for your help. here is a rough background "tree" sketch taken from XkyRauh's abandoned Episode Pound mod. the only input I'll give is that I'd like to double it in size. other than that I'm asking for your imagination: in which way should these trees be modeled. I'm looking for suggestions on shape, colour, dithering, etc... everything that comes to mind. Last edited by Nisaba on Thu Oct 18, 2018 20:48, edited 1 time in total. It looks to me like very large blades of grass, nearly thrice the height of Keen. Some sort of bug or lumberjack creature must take a liking to this kind of plant. Are they white in the inside? When they are cut, does liquid leak out? Are they juicy? Maybe something comes along, takes a large bite, and proceeds to the next one. A sensible alien would chop down the entire stock, stew it like leaks and make a proper soup or salad. I feel like nom nom celery. XkyRauh wrote: I guess for me, with forests, they're frequently green-and-green-and-green and there isn't a lot of red. Perhaps some autumn? I don't see anything wrong with the suggestions. 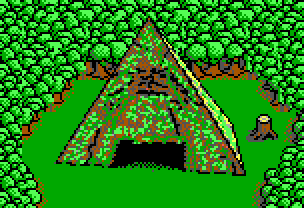 I mean they're kind of standard for forest type of environment and I by myself am using such, but they give you already plenty of options. On top of that, if you have something unique to show in the level (like a talking tree or a big slug statue or something else) you may want to emphasize on that and make it appear on the world map as well. I agree with Roobar. 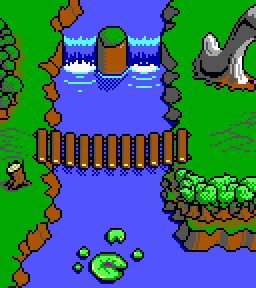 Its always cool when the exterior of the level on the map kind of fits with what you see inside the level. Also, I'm glad to hear you are still working on this, I played the demo a while ago and I thought it was pretty cool. thanks for your advice. that's exactly the path I've already trod. of course I intend to keep on doing so. I'm just looking for further ideas, which will help me to come up with new stuff to build a level around. I for one find it easier to define a level topic beforehand and subsequently doing the level design in line with this theme. so if you should have a suitable topic besides the ones already mentioned above, I would very much like to hear about it. and yes I'm still working on this! thanks for all your kind words / motivation boost! It's always good to hear that people find interested in what I do. current status: 20 creatures animated. That's looking cool! And that's a lot of creatures! If you need inspiration, just look in google for pixel art forests or whatever you need or just look at other platformer games for ideas.